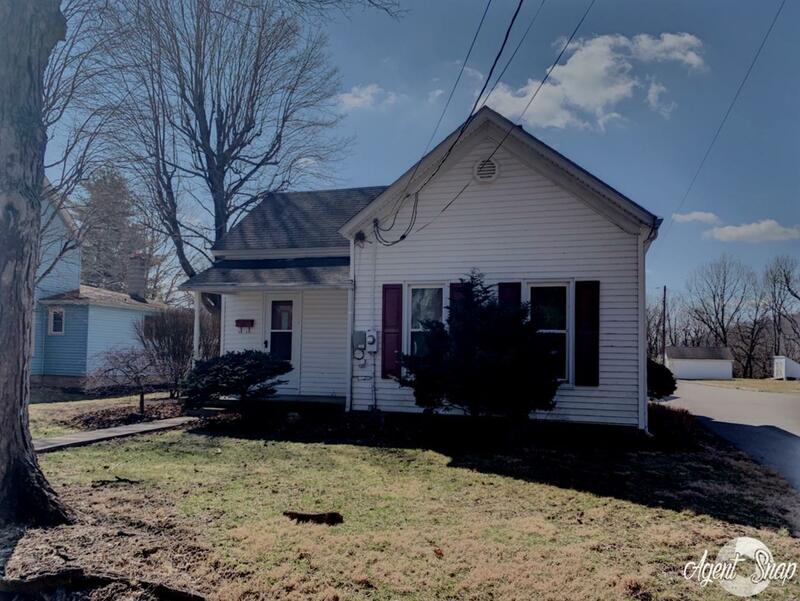 Adorable bungalow located on quiet street in town.Perfect for those looking for character of older home w/high ceilings and woodwork.1 level living with large bathroom and step-in shower.Large detached 2 car garage w/space to create. Low maintenance yard and living space. Don't wait to welcome yourself home. Brookville, the 'gem of Indiana', located in southeastern Franklin County, sums up all the reasons you choose a small town. Its rural charm is loaded with amenities, recreation, and attractions. Location is usually the biggest selling point for a home or neighborhood, and nestled in a lush valley, Brookville has one of the most scenic sites in the area. The country surrounding the city of Brookville is still 60% farmland, and Brookville is home to Indiana's largest lake, Brookville Lake. With over 5000 acres of swimming, boating, and fishing pleasures, the lake is set in 16 thousand acres of woodlands. The lake was originally built for flood control in the Whitewater River valley, and now serves as a recreation destination for much of eastern Indiana. Downtown Brookville thrives with small city charm as a hub of activity for Franklin County and the surrounding region. Dining, shopping and other entertainments keep pace with business and industry including Fortune 500 member Owens Corning. You're sure to find your style here; many of the existing homes showcase classic Italianate, Victorian and country farm houses. Further out of town new construction offers subdivision living amid the rolling hills of Franklin County. 30 miles northwest of Cincinnati, Brookville is just 10 minutes off of Interstate 74. US 52 is the primary route through downtown. St. Rt. 101, and St. Rt. 1 offer access to all the town's charms. Franklin County Public Transportation offers convenient and economical transportation options for area residents. McCullough Hyde Regional Medical Center on St. Rt. 101 provides diagnostic and treatment services. Rush Memorial Hospital in nearby Rushville, Fayette Memorial Hospital in Connersville, Dearborn County Hospital in Lawrenceburg and Margaret Mary Community Hospital in Batesville are the closest community hospitals. Hospitals in Cincinnati are an hour drive away. Downtown provides a gamut of shopping opportunities, ranging from discount stores and pharmacies to family owned and operated grocery stores, and there is craft and antique shopping in nearby towns. The unique jewelry and gift shops on Main Street feature original 1881 showcases and architecture. Brookville Lake is the center of water sports, offering water recreation options including fishing, skiing, boating, swimming, canoeing, and more. The rushing White Water River keeps two canoe liveries active during the spring and summer season, and riders frequent the two horse stables for scenic back road jaunts. Several city and county parks abound with playground equipment, ball fields and tennis courts. Local merchants and residents sponsor an annual 4th of July fireworks display at the reservoir dam which is spectacular. For golf enthusiasts, Brooke Hill Golf Course is the local favorite. North of town Buck's Point features lakeview relaxation.